The influence of Le Corbusier, a pioneer of modern architecture in the twentieth century, has been wide ranging, including the Le Corbusier LCS Ceramics collection, available exclusively at Artedomus. LCS Ceramics is based on Le Corbusier’s use of reinforced concrete in architecture, which came to be known as béton brut (bare concrete), and his Polychromie Architecturale system, which explores how colour can affect spaces and people. The collection includes béton brut-inspired finishes; glazed colours (LCS1); tiles engraved with linear bas relief (LCS2); light, speckled tiles (Tokyo); and neutral, textured surfaces (Molitor). They are ideal for wall and floor coverings in residential and commercial projects and are designed to work together and independently. Unite d’Habitation was Le Corbusier’s testing ground for his revised architectural polychromy. He created his first colour system in 1931 with 43 subdued shades. In 1959 he added 20 bolder hues. Le Corbusier selected the 63 colours from nature, with a historic, artistic and associative background. This is why the colours remain beautiful, timeless and modern, even decades later. The colours can be harmoniously combined and are highly architectural while being suited to natural tastes and needs. Beton Gris and Beton Blanc are inspired by Le Corbusier’s use of raw, exposed concrete. The neutral-coloured ceramic porcelain surfaces reminiscent of the minimalist character of béton brut, with a lighter (Beton Blanc) and darker (Beton Gris) finish. The tiles are available in six sizes, from 297-by-147-millimetres up to 2500-by-1200-millimetres panels. LCS1 is a range of 12 colours selected from Polychromie Architecturale. Consisting of six subdued shades and six bolder tones, it includes soft, subtle, neutral finishes; bright yellow, red, green and blue; and a lustrous, solid black. The glazed colours are hand made in an artisan workshop in Faenza, Italy, and are available in 1200-by-300-millimetre panels for interior and exterior use. LCS2 is a collection of six tiles that feature linear bas relief engravings on a Béton Blanc tile. 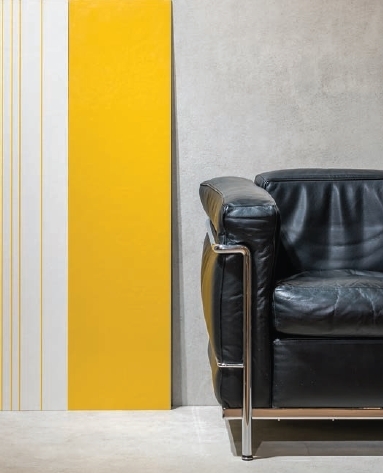 The matt-finish tiles are etched with grey, red, yellow, black, green or blue lines, and are available in two sizes (30-by-120 millimetres and 15-by-30 millimetres). 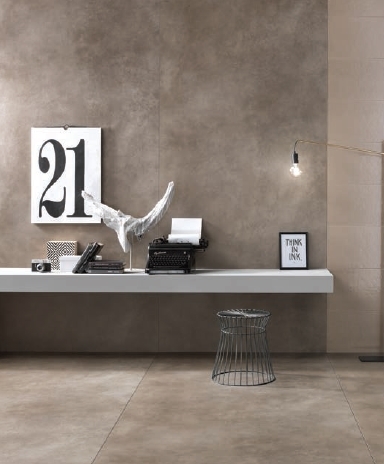 They team perfectly with the LCS1 and Beton tiles, offering endless possibilities for creating modern and timeless surface designs and distinctive feature walls or floors. The Tokyo collection is inspired by the National Museum of Western Art in Tokyo, designed by Le Corbusier in 1955. The tiles have a soft, speckled appearance and are available in six colours to complement LCS1 and LCS2. The Molitor range draws inspiration Immeuble Molitor, an apartment building Le Corbusier designed with Pierre Jeanneret in the early 1930s. The six neutral-coloured surfaces have texture evocative of the building’s glass masonry block façade. Tokyo and Molitor are ideal for internal and external wall and floor coverings in residential and public projects. Le Corbusier LCS Ceramics are manufactured by Gigacer Spa in Faenza, Italy, and exclusively imported and supplied in Australia by Artedomus. Artedomus is setting the benchmark in truly exceptional tiles, stone, architectural surfaces, bathware and furniture. LCS Ceramics are on display at Artedomus’ four showrooms across Sydney, Melbourne, Brisbane and Perth, and viewable online at www.artedomus.com.